Historic Levuka lies on the island of Ovalau, off the north-east coast of the main island. The town is famous for its stately backdrop of 19th Century colonial architecture and waterfront promenades. A quiet and tranquil place, Levuka was once the bustling and unruly first permanent European settlement in Fiji. 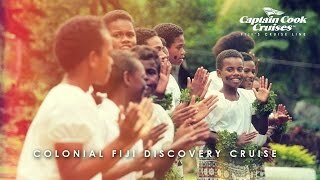 Originally chosen as the capital of Fiji because of it’s safe anchorage, it’s central location, and it’s proximity to the chiefly island of Bau, Levuka became the first seat of power of the Vunivalu or “King” of Fiji, Ratu Seru Cakabau in 1871. However Levuka was unable to develop as a capital as the lush green hills that rise behind the town restricted the amount of available land needed for expansion and eight years after Cession of Fiji to Britain on October 10, 1894, the decision was made to move the capital to Suva, the present day capital. The town’s heyday was in the mid to late 19th century as the cotton and copra booms of the 1860’s brought a flood of planters and other settlers to Fiji and it is hard to imagine that 120 years ago Levuka supported a resident European population of approximately 3,500. Early residents were a lawless and motley collection of fugitives, whalers, traders, pioneers and missionaries and ships, it was said, could find their way through the reef passage and safely into port by following the line of bobbing gin bottles drifting on the outgoing tide! Over 50 pubs, hotels and lodging houses catered for the early residents and traders, many of which were swept away by cyclones in 1888 & 1895, but The Royal Hotel at the north end of town remains and is the oldest hotel in Fiji – dating back some 150 years. The department of Town & Country Planning declared Levuka a historic town in 1989 and it has been nominated for listing as a UNESCO World Heritage Site. Access to Levuka is by local air operators from Suva or on special Northern Fiji Cruises departing from Denarau, or explore the town on our 7 night Colonial Fiji Cruise.